Last fall, the nonpartisan Public Religion Research Institute noted the growing number of religiously unaffiliated Americans: Nearly one of every four people is unaffiliated – a threefold increase since the 1980s. Often called “nones,” this group encompasses agnostics and atheists, as well as those who simply do not belong to a religious community. The common linking of religion with conservatism in the U.S. has prompted speculation that a growth in the number of people without a religious affiliation would increase support for liberal policies. Indeed, there is analysis that shows that unaffiliated Americans are twice as likely to identify as liberal than as conservative. However, some observers disagree. They argue it is impossible to know whether decreased religious affiliation will benefit political liberals. As a historian of American religion, I have studied people who have disaffiliated from churches. History suggests caution about political generalizations. Scholars such as Christian Smith have shown that many noted Americans — such as the Supreme Court Justice Oliver Wendell Holmes Jr., attorney Clarence Darrow, and Cornell University founding president Andrew Dickson White – adopted a secular worldview. But a shared rejection of religion did not lead to shared political views. This was demonstrated in the 19th century by two men who left Christianity: the lawyer and Republican Party power broker Robert Ingersoll and Yale University social scientist William Graham Sumner. Ingersoll and Sumner had much in common. Both grew up in mid-Atlantic states before the Civil War. Both came from families that adhered to strict forms of Protestant Christianity. Indeed, Sumner briefly became a clergyman in the Episcopal Church. Both were early advocates for Darwin’s evolutionary theory. Ultimately, both men abandoned religion. Each became noted for his particular critique of religion. Ingersoll was the most famous agnostic of the day. He toured the country proclaiming his message of unbelief to large audiences. Sumner joined the faculty of Yale. He pioneered the field of academic sociology and led the effort to secularize higher education. Despite their similar path to becoming unaffiliated, Sumner and Ingersoll had little in common politically. This was especially true on the major issue of their day: how society should care for the poor and working class. America endured social upheaval as it underwent mass industrialization in the late 19th century. At the same time, the country experienced a long recession. The questions prompted by these developments dominated political debates: Should charities support the able-bodied unemployed? Should the government care for the poor? Should industry be subject to regulation? These questions divided Ingersoll and Sumner. Ingersoll urged charity toward the poor and needy. He also advocated a more active role for the state. Government institutions, he believed, could protect workers from exploitation and ensure Americans’ well-being. Ingersoll and Sumner left Christianity for similar reasons. But their beliefs led them to very different political opinions. They reflected the range of views held by the increasingly visible population of unaffiliated Americans of their day. There is reason to believe a similar diversity of opinions exists today. 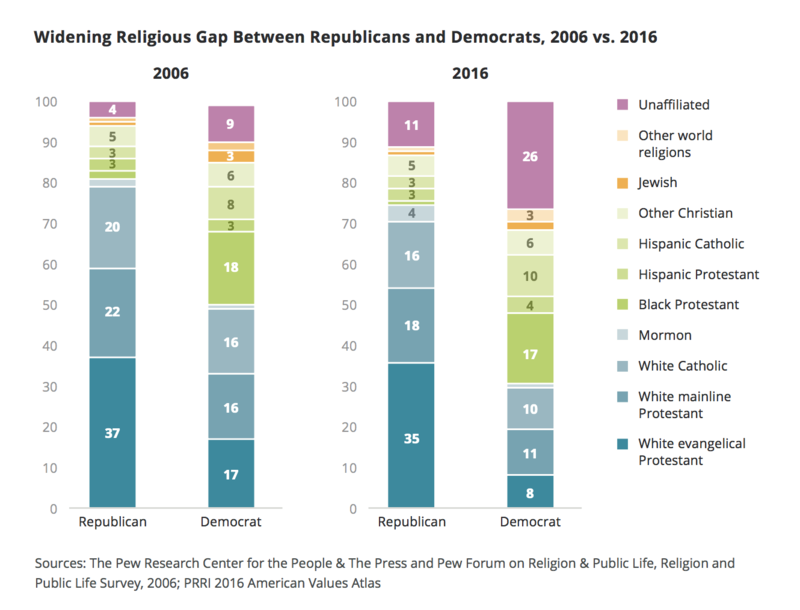 The Public Religion Research Institute’s study notes that the religiously unaffiliated are more likely to be Democrats than Republicans. But more unaffiliated Americans identify as independents than as members of the two parties combined. This breadth of political views aligns with data in a 2012 Pew study. That analysis found unaffiliated voters to be more liberal than the general public on abortion and gay rights. But on the broader issue of the size and scope of government, unaffiliated Americans differed little from their religious neighbors. Both religious and nonreligious respondents were nearly evenly split on the question of whether or not they desired smaller government, a longstanding conservative position. This suggests that while unaffiliated people hold more liberal views on some social issues, they are not united in their political beliefs. These data confirm the lesson of history. It is not easy to generalize about the political views of Americans who reject religious institutions. Politicians and parties who predict their future based on declining religious affiliation do so at their peril.